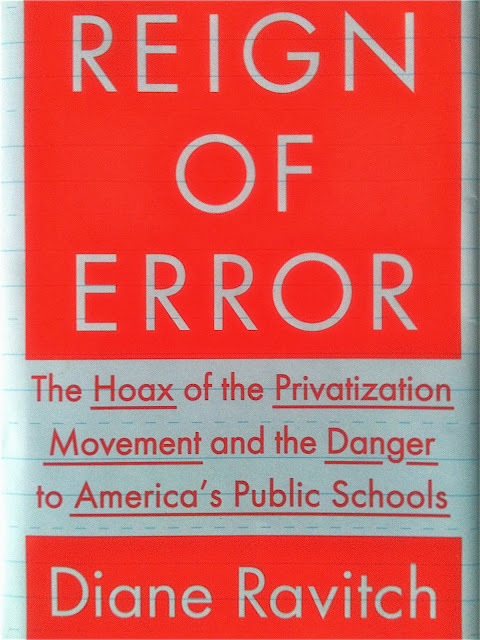 I'm going to finish the week with one more post on education historian and researcher Diane Ravitch's new book Reign of Error: The Hoax of the Privatization Movement and the Danger to America's Public Schools. The last I heard, in just 3 days the book has risen into the top 50 in sales on Amazon and is the #1 public policy book in America. It's a good start. A lot of people need to read this book and I want to do what I can to help that happen. I suppose if you want to say one good thing about the corporate education privatization movement it is that they, with their billions of dollars and bully pulpits, have helped make public education a front burner issue. In a political climate in which it seems very little can get done, this is one issue upon which legislatures and executives across America have actually found enough common ground to make something happen. Sadly, it's a common ground built upon the big lies of the privatizer's well-funded misinformation campaign, and these reforms have done nothing but further damage our schools, placing their very survival in question. Of course, as Ravitch repeatedly points out, that's their plan: the destruction of public education in favor of a "free market" system, one driven by competition and profits rather than, you know, actual education. A lot of people need to read this book because the only thing that has ever successfully pushed back against monied elites is we the people, collectively saying, "Stop!" I know, I sometimes hear that cynical voice the back of my head as well, doubting the efficacy of our democracy, but when I look back over my lifetime, I've seen major progress on issues once thought too well-entrenched to change: women's rights, civil rights, and gay rights have all made dramatic progress in my lifetime. Peaceful popular resistance has ended wars, and recently, in the case of Syria, may have averted one. What I've come to understand is that democracy in the real world is both slow and messy, and it only works for the people when the people stay engaged. Going forward, I intend to use Ravitch's book as a tool and to continue using this space as a soap box from which to discuss these vital issues, but if we are truly going to serve our children and, through them, our democracy, we will need to do more than to shout, "Stop!" although that is the necessary first step. And while we have managed, I think, to slow down the privatization train, it continues to move forward. We need more well-informed citizens to join us, and a good place to start is this book. The second half of Ravitch's book is her proposals for solutions to many of the very real problems in education, most of which, as she clearly details, are merely symptoms of the much larger societal problem of poverty. Yes, Ravitch does go into specific research-based reform proposals, relatively manageable solutions like more early childhood education, smaller classes, strengthening the teaching profession, reforming charters to work with and not against public schools, the end to high stakes standardized testing, and a broad and deep curricula instead of the increasingly narrow one envisioned by the privatizers. But at the core of her message is that our schools are operating in a world that is increasingly hard on children, and schools cannot be expected to handle these problems on their own. It will take our full democracy, all of us working together as we have in the past to affect real change. Of course, none of this is the kind of shiny object quick fixes being promised by the privatizers. It will take money and political will. And sadly, it will likely take a long time, but that shouldn't stop us. People often believe that there is nothing they can do, that the levers of government are so remote from their day-to-day lives that they despair of anything ever getting done. Yet when we look over the scope of our history, we see the American people time and again, when we are well informed, making the right thing happen. It may take a long time and there will be set backs along the way, but it is the story of our country. Here's what you can do: start by becoming well informed. A good starting point would be reading this book. Then talk to the people in your world about what you know and wish for our schools. This is the kind of day-to-day, retail level politics that winds up shaping the world. Write and call your elected representatives and write letters to the editors of your local newspaper. Attend your local school board meetings. Become active in your neighborhood school's PTA. But mostly talk. Talk about these matters around your dinner table, at the coffee shop, and while otherwise engaged in your social networks. The local school just up the hill from Woodland Park is where many of our students wind up after leaving preschool. In the last two years, parents of three of our children have been hired as staff, and several more are involved as parents. Engagement: this is how to get the education you want for all children. Despite its faults, the American system of democratically controlled schools has been the mainstay of our communities and the foundation of our nation's success. We must work together to improve our public schools. We must extend the promise of equal educational opportunity to all the children of our nation. Protecting our public schools against privatization and saving them for future generations of American children is the civil rights issue of our time.